A Phoenician port dating from as early as the 11th century BC; Cadiz was a must stop. 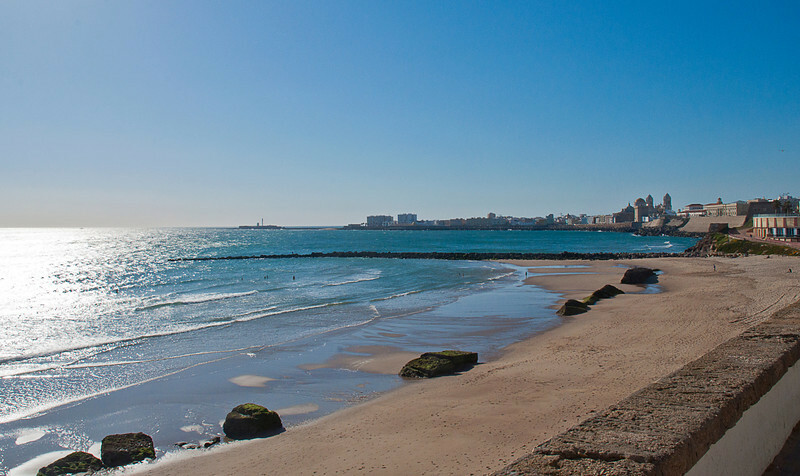 The oldest continuously occupied city in Western Europe; Cadiz was once an island connected to the mainland by a bridge about here, the area called Puertotierra. This is the beach called Playa de Santa Maria del Mar. The structure in the left background is the Castle of San Sebastián built after Drake besieged the town in April 1587 and occupied the harbour for three days, capturing six ships and destroying 31 others as well as a large quantity of stores (an event popularly known as 'The Singeing of the King of Spain's Beard'). The attack delayed the sailing of the Spanish Armada by a year.